There are some festivals I have been over the years where, to be fair, the gig doesn’t live up to expectation. Most are great fun, don’t get me wrong. And for any author, it is wonderful to be let off the leash now and again, to go and drink with friends and chat about mutual interests, or to talk about the appalling behaviour of publishers and agents or, as one of my colleagues prefers to describe them, the industry reptiles! However, it is a sad truth that for authors, very often being thrust (kicking and screaming) into the limelight is a refined form of torture. Especially for historians. You see, it really doesn’t matter who and what we write about – there are always more people who read the books who know more about the subject than we do. Then again, there are many folks who want to talk about how they can get into print, whether I can read their work for them (sorry, no), or advise on the best agents (I’m not an expert: I only have the one). However, every so often we find a festival where the people are great, the organisers pull out all the stops and, to be frank, it’s just fun. Last weekend was one of them. First of all, I was working alongside my friend Angus Donald, the author of the excellent Robin Hood series. Angus is one of those larger than life characters with whom it is fun to work. He is cheerful, amiable, humorous, and has a wicked sense of fun. He also has a streak of professionalism that runs through his entire body. In short, he is a great companion. 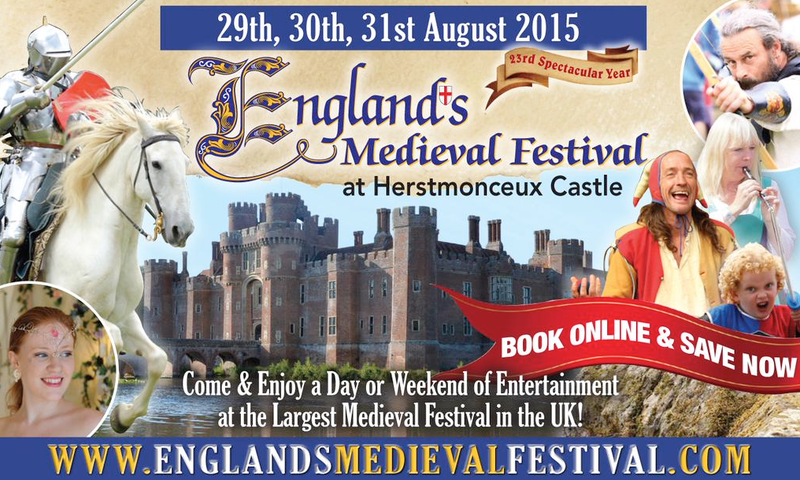 I’d never been to Herstmonceaux and the England’s Medieval Festival before, but I’ll be trying to go again. Mainly so I see a bit more of it (that is the downside of being stuck behind a table selling books). I managed to see several passes of knights jousting, and the medieval campsite was really incredible. I would dearly love to take up archery again, and the number of makers of long bows were just wonderful to see. Then again, I’ve always wanted a sword, and there were manufacturers from all over Europe. On the first evening I was invited to share drinks with a pair of delightful Polish guys who had brought a selection of wooden mugs, chairs, and an array of alarming axes. Adam, I learned, was a keen martial artist, and he was intensely proud of his selection of weapons. With good reason, I hasten to add. I have to mention my own highlight, though. Lots of readers and fans, I’m glad to say! There were also two German Kampen who demonstrated their skills with knives and swords in a display that was both stunning and very funny. These two, the Klopffecter, led by Daniel Faustmann and his colleague Falk von Falkenstein, were superb. They demonstrated a series of moves from the old fencing manuals: first in slow motion, then at full speed. Absolutely brilliant to see, and they brought Talhoffer’s manuals to life. Not the daft Hollywood style of sword play, but real, effective ways to kill your enemy. Deadly but fascinating – and with Daniel and Falk talking through the manoeuvres, very funny too. Couldn’t pick a much better location! 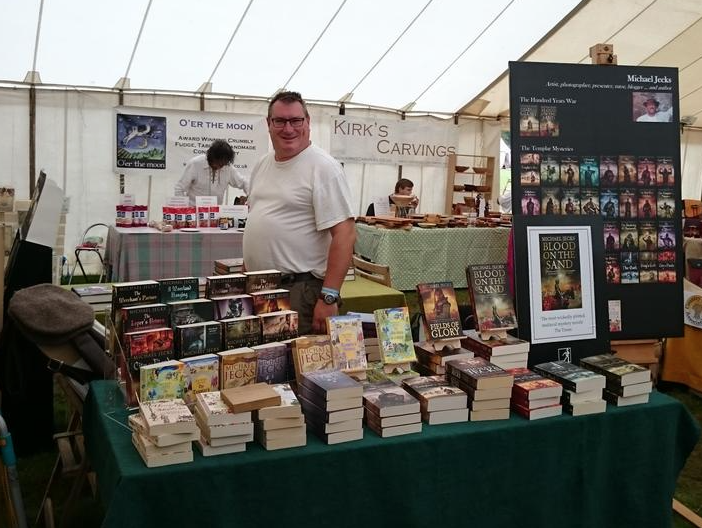 But the joy for me was to be at a festival with so many great, interested new readers. It’s wonderful to have been let loose on a swathe of the public who were previously unaware of my series, and to sell them books that, hopefully, they’ll enjoy for years to come. Mind you, Beccy and the other staff at the ‘Buxom Wench’ tavern helped by serving Angus and me with copious quantities of the best ales. I particularly enjoyed ‘Mosaic’. I’ve no idea where it came from, sadly, but it was great. Until it ran out. 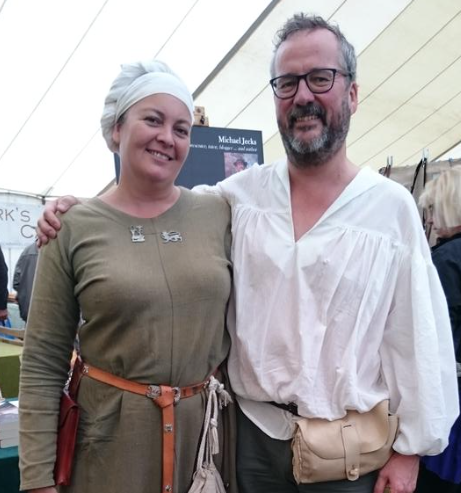 Still, Angus and I both had a wonderful weekend, and we’re very grateful to the festival for their help and professionalism in helping the whole festival go so well. And on a personal note, I think that the idea of pulling down the back of the beer tent on Sunday night so that we could all watch some films was a brilliant idea, as was the choice of films. I would never have expected to sit next to Angus, bearing in mind the subject matter of his series, while watching a cartoon film involving a Fox as Robin Hood … Yes, the Disney version. It was excellent, as was the subsequent offering: Knight’s Tale with Heath Ledger! With luck, when I’ve finally sold the film or tv rights to my series, I’ll be able to get myself a bow and arrows and a sword. And maybe some chainmail too. Now that would be nice! 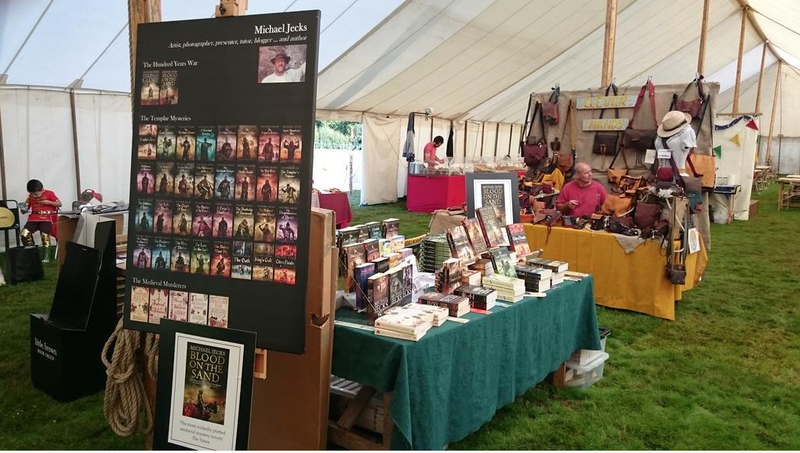 Many thanks to Herstmonceaux Castle and the England’s Medieval Festival for a great weekend. I hope to be back next year! NOTE: I was keen to extol the virtues of my black leather drinking mug while there. I bought it many years ago, and it’s been with me Morris dancing more times than I can remember. In fact, it’s been stood on and cracked internally more times than I can remember. Over the twenty years or so since I bought it, I’ve had to regularly get a blow torch to the black pitch interior to reseal it. And that’s the joy of a leather tankard: you can mend it often! But on Sunday night, shock horror, the darned thing fell out of my bag on the way back to my room. I was mortified. But Monday morning, it was handed back to me. The lovely folks at the next pitch had seen it as they walked past a little later, and rescued it for me. 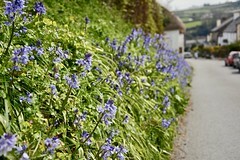 Many thanks to the ‘Clever Hands’! Table ready for selling – and mug-savers at their stall on the right! Thanks, folks! It’ great that your work takes you to such fun places. I’ve always wanted to go to this festival. Did you attend the banquet? TV series would be awesome-please someone make this happen! It was really good fun. Sadly didn’t make it to the banquet – the extra cost would have chewed through any profit, so the evening with Angus watching Robin Hood and chuckling to ourselves was more cost-effective! I do agree about the TV/film potential, though! If that nice Mr Spielberg would care to make an offer …! That sounded like a great festival and the perfect place for you to relax and have fun. 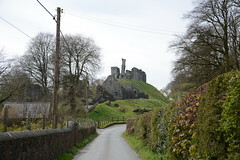 I loved the picture of the castle and the woman in costume. Since I live in the US, I can only live vicariously through the written word and TV. I agree with the previous poster; I would love to see series based on your writing. It was excellent, and I can recommend the swordsmen. I’ve put a video up of the two on my FB page at http://www.facebook.com/Michael.Jecks.author – really good pair of martial artists. I did view the video. Thank you for posting it. Many thanks, Kay. Glad you liked it! You mean you were within thirty miles of my front door, and you didn’t tell me! 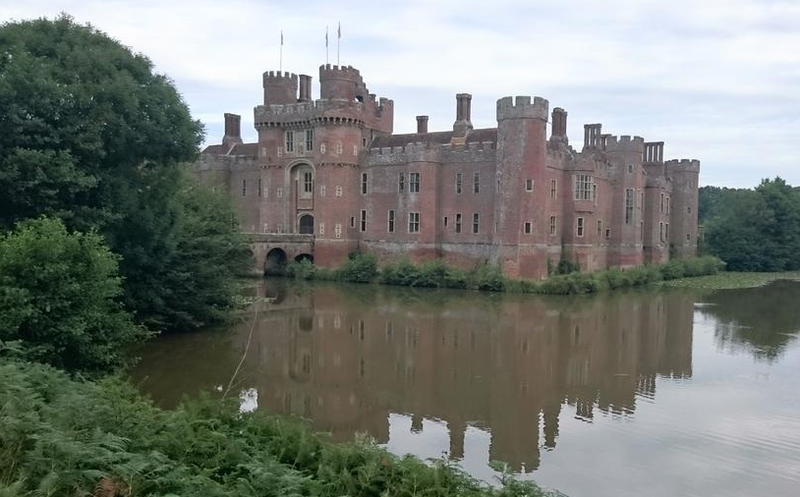 Herstmonceux is a beautiful walking area too. Didn’t even occur to me that I was so close, matey! Sorry about that. Would have been good to see you for a glass or two of the needful. Hope to see you soon! 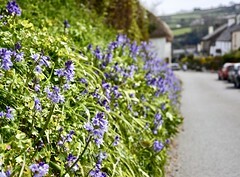 That looks great, somewhere I’d like to photograph.. I think it’s always open to the public, luckily. It was the Royal Observatory for a while, but now it’s an educational institution. Lovely place to visit. am putting it on my ‘places to visit when I retire and get free bus travel’ list of places to visit! Cheers. BTW Am so enjoying the Templar series :) Thanks. Many thanks, Fraggle! Really glad you’re enjoying the series, too. Happy reading!